Fuchsias were first identified around 1696 in the Dominican Republic which is just south of Cuba. The majority of fuchsias originate from sub-tropical areas of the world although a few are native to cooler areas. This explains why the majority are tender plants but some can withstand UK winters. They make ideal plants for growing in the UK not only for their beauty but also because they can so easily be propagated by the amateur gardener with no special equipment at all. One plant bought in March and protected from frost can be used to create ten or more others at no cost at all. There are few plants which can be grown so economically. Many fuchsias are grown all year round in pots and containers filled with multi-purpose compost, others are grown in open ground in a variety of soils and all grow well in most conditions as long as the growing medium is kept moist but not water-logged. 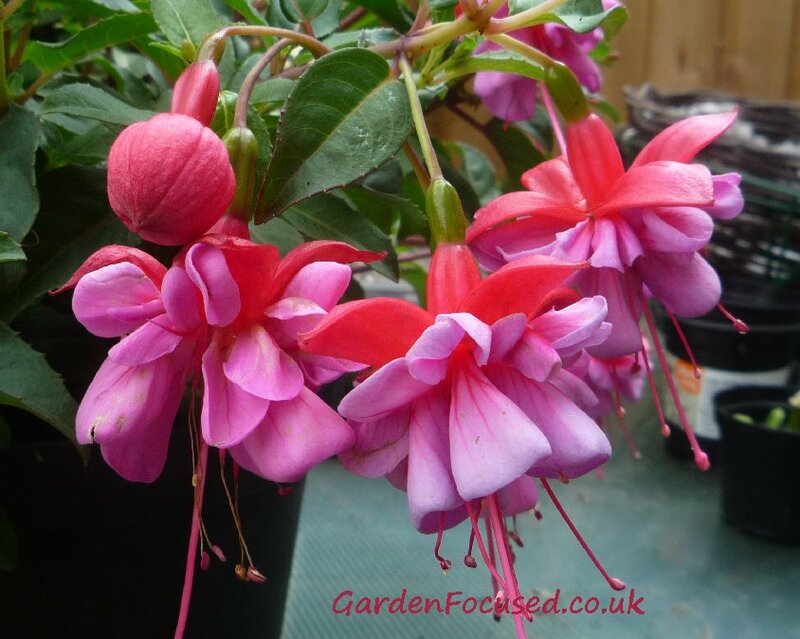 If there is a difficulty with fuchsias it's not the amount of sunshine or soil conditions, it's a matter of timing. Our calendar below solves that problem for you and it can be made more accurate for your area of the UK if you set the dates to be accurate for your home town. Take a minute to do this now and then return here for dates which will stay set to your home town for many months. The calendar below lists dates for propagating fuchsias by cuttings, how to care for them and how to grow on shop bought plants. It also has key dates for over-wintering your plants in containers. Click on any of the entries below to be taken to a detailed section with lots more information. Remember, the calendar below is a guide and over the time you grow your fuchsias your timings may begin to differ slightly. QUESTION: I have a fuchsia plant which I bought as a Mother's Day gift many years ago my mother died in 1998 and the plant was bought approximately 5yrs before. I take little care of it. It is planted in an old chimney pot.it now flowers more than it ever did and has been flowering from December . How long do these plants live? Is it time I gave this beautiful old plant some TLC? ANSWER: I would continue to treat it exactly as you have done for the past years. It clearly suits it! As for the how long they live for I would guess that a fuchsia will live around 30 years. Because the plant has memories for you I would suggest that you take a cutting and either grow it elsewhere in your garden or give it away to a friend. If anything happened to the original plant you will then have a replacement or can take a cutting from the fuchsia you gave away. WHY NOT LEAVE YOUR QUESTION / COMMENTS ABOUT THIS PAGE? ENTER THEM BELOW. EMAIL ADDRESS IS OPTIONAL. YOUR COMMENTS WILL BE ADDED ABOVE WITHIN A FEW HOURS.